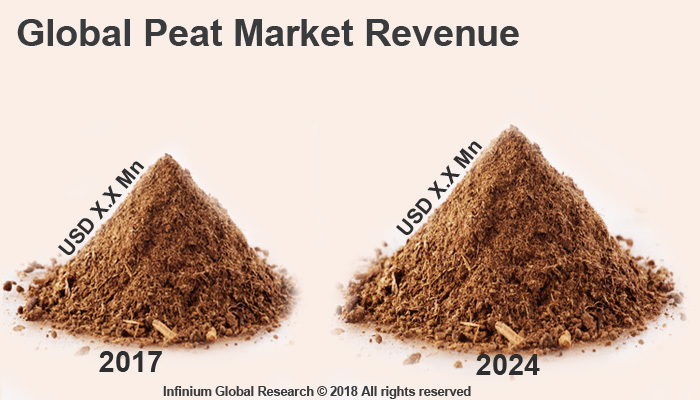 A recent report published by Infinium Global Research on peat market provides in-depth analysis of segments and sub-segments in global as well as regional peat market. The study also highlights the impact of drivers, restraints and macro indicators on the global and regional peat market over the short term as well as long term. The report is a comprehensive presentation of trends, forecast and dollar values of global peat market. According to the report, the global peat market is projected to grow at healthy CAGR over the forecast period of 2018-2024. Peat is a heterogeneous mixture formed by decomposition of plant (humus) material that has accrued in a water-saturated environment and in the absence of oxygen. The peatlands, bogs, mires, moors, or muskegs are primary resources of peat. Peat is harvested as an important renewable source of fuel or energy in certain parts of the world. The peat is used in horticulture and agriculture sectors to provide tremendous ventilation and moisture to the soil when it is combined with the soil. The peat is mainly used in the agriculture and fuel applications. The growing people interest in gardening will probably encounter their inclination towards peat moss. Peat moss is commonly used in the gardening to improving soil, starting seeds, adding it as an amendment, and more. The growing use of peat moss for agriculture and gardening is driving the growth of peat moss market. The peat has a significant amount of carbon and hydrogen contents that helps them to be used as fuel. Rapidly growing adoption of Biobased fuel is likely to boost the demand of peats market. The peat has numerous benefited that includes high absorbency, sterile material, acidic pH features, compaction prevention properties, and more so they used in the many applications. In addition, increasing peat applications in agriculture, water filtration, freshwater aquarium, and others are anticipated to boost the growth of peat market. On the other hand, although the peat is an organic material, it does not contain any nutrients that help in the plant growth so this disadvantage of peat may hamper the growth of peat market. Moreover, the growing adoption of peats products in the water filtration systems is projected to create several opportunities in the upcoming years. Geographically, North America holds the maximum share in the peat market and the Asia Pacific is the fastest growing county in the peat market. In the North America region, the growing use of peat products as the alternative fuel drives the growth of the peat market in this region. The rapidly growing agricultural activities lead to a huge demand for peat products in the Asia Pacific region. The report on global peat market covers segments such as material types and applications. On the basis of material types, the global peat market is categorized into fibric, hemic, sapric and others. On the basis of applications, the global peat market is categorized into fuel & energy, agriculture, domestic, medicine, and others. The report provides profiles of the companies in the global peat market such as Global Peat Ltd, Elva E.P.T. Ltd., PEAT LAND UKRAINE LLC, Klasmann-Deilmann GmbH, Neova AB, Vapo, Stender AG, Oulun Energia Oy, and Globalcoirs. The report provides deep insights on demand forecasts, market trends, and micro and macro indicators. In addition, this report provides insights into the factors that are driving and restraining the global peat market. Moreover, IGR-Growth Matrix analysis given in the report brings insight into the investment areas that existing or new market players can consider. The report provides insights into the market using analytical tools such as Porter's five forces analysis and DRO analysis of peat market. Moreover, the study highlights current market trends and provides forecast from 2018-2024. We also have highlighted future trends in the peat market that will impact the demand during the forecast period. Moreover, the competitive analysis given in each regional market brings insight into the market share of the leading players. This report will help manufacturers, suppliers, and distributors of the peat market to understand the present and future trends in this market and formulate their strategies accordingly.